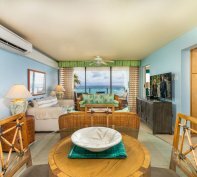 For a quite simply stunning beach condominium rentals in Barbados, take a look at Palm Beach in Hastings on the south coast of the island. 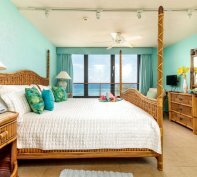 The condominiums are an elegant combination of style and design complimented by spectacular Caribbean sea views, an extensive array of amenities, including swimming pools, fitness centre, shopping and dining, as well as a taste of the night life for which the South Coast is renowned. Set on over 4 acres of prime beachfront land located in Hastings, Christ Church, this exciting new development comprises fifty nine residences featuring both 2 and 3 bedroom condominiums. Each residence accommodates a spacious master suite, en suite bedrooms, large outdoor terrace, open-plan living/dining area, kitchen with granite counters and utility room. The terraces are particularly spectacular with room for daybeds, sun-loungers, outdoor dining and relaxation. 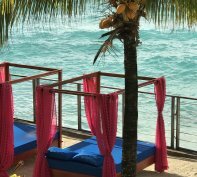 If you are looking to chill out and recharge your batteries whilst on vacation in Barbados, this is the place for you! 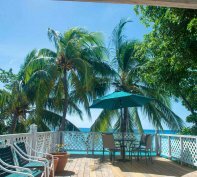 Most of our guests who choose one of these beach condominium rentals for their vacation in Barbados say they never want to leave the terrace and who can blame them? 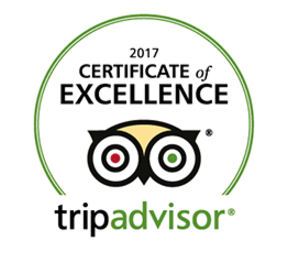 If you don’t believe me hear what some our guests have to say:- “A slice of heaven!” “A huge space that sits in the clouds! !” “My two sons were so excited when they saw where they would be staying they actually ran up and kissed me”. Get the picture? Imagine at the end of the day with a rum punch in hand lounging on the day bed watching the sunset, you will be hypnotised, trust me. 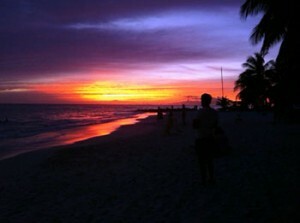 Barbados sunsets are something else. Yes the Condominiums @ Palm Beach certainly cater for the discerning amongst us who want the best of the best including a waterfront lifestyle, homes that are finished at the highest standards and a development that offers absolute privacy. 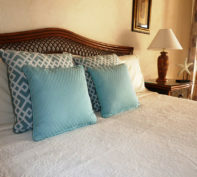 It affords its residents tranquillity in its unique location just off the thoroughfare of the bustling South Coast, convenient for the capital of Bridgetown and beautiful south coast beaches. Within walking distance of nearby restaurants, for example Brown Sugar, 39 Steps or TGI Fridays and only minutes away from St Lawrence Gap if you want to party! 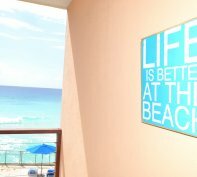 To enjoy a beach condominium rental in Barbados look no further than Palm Beach with its rare combination of sophisticated elegance and design set in the heart of the South Coast and enhanced by a vast array of amenities not to be found anywhere else. Come and take a look!